In keeping with the high-level treatment of its combat system, Night’s Black Agents can either be said to have no grappling rules – or rather no specific grappling rules – or, more properly that the rules for combat are abstract enough that all incapacitation effects and methods are treated the same way. You still roll versus the same target number using the same skill (Fighting or Weapons), and if you want that to be an arm bar or a punch to the face, it doesn’t matter. If you want any reductions in Health to represent pain and incapacitation rather than broken and crippled limbs, you can note it to the GM and when the fight is over, the foe’s Health can simply be restored to full value. Being in a condition of Hurt (Health from zero to -5) means that the character has to roll versus “unconsciousness” once – a good proxy for immobilization – and if you succeed, your target difficulties go up. Narratively, this means you’re tangled up. If you’re “Seriously wounded” then you can’t fight – so you’re basically out of the fight. If the victor wants to convert this to injury – up to and including sudden and spectacular death – that’s probably fair. In GUMSHOE, grappling is functionally the same as any other type of Hand-to-Hand combat: when an enemy’s Health is down to 0 (or they’ve failed a Consciousness roll), they’re out of the fight, whether they were punched out, kicked out, or armlocked out. Health isn’t precisely “hit points,” it’s a dramatic measure of how much fight you have left. Players who just want a little more flavor, riffing on krav maga or other lock-and-strike style martial arts, should use lots of Smashes (see p. 76), Called Shots to the throat or joints (see p. 72), or even Mook Shield (see p. 76) if the Director allows it. Reckless Attack (see p. 76) can also model grapples, lowering the Hit Threshold of both the grappler and the grappled. Grappling is considered a Situational Combat Rule in Savage worlds, using a slightly different mechanic then regular combat – it’s an opposed roll, doing no damage. If your Fighting roll beats your foe’s he’s entangled. If the roll succeeds with a raise (p. 63 describes a Raise on an opposed roll) the target is also Shaken. You can choose to break free (the best of each combatant’s Strength or Agility in an opposed roll), but if not, being entangled is basically a -4 to all tasks. It’s possible to cause injury by grappling, but it’s not specific as to how. You make an opposed roll (again, the best of Strength or Agility for each fighter) and if you win, you inflict your Strength as damage, with an extra d6 if you get a Raise, as usual. Being prone in melee is worth -2 to Parry and Fighting rolls, so getting your foe on the ground (and not being there yourself) is worth something. You can Push by winning an opposed Strength roll, and one of your choices on a win is to knock the other guy flat. Disarming seems to be more related to striking than grappling, though applying the Disarm rules to the injury condition above would not be crazy-talk. Roll an attack at -2, and if you hit, you roll your damage as usual, but opposed by your foe’s Strength. If he loses, he drops his weapon. Grappling certainly isn’t an “I win” button. A combatant with a d10 in Fighting against an average foe (d6) will grapple about 70% of the time (beating the foe by 1 or more), while against a TN of 5 5, he will hit in melee about 73% of the time – basically the same in this situation. Some of this advantage is the Wild Die, but not much (a few percent perhaps). The impact is significant – the -4 penalty is pretty harsh – coming flat off the top can be thought of as perhaps neutralizing the results of the Wild Die, but really it’s just one Raise less, assuming you succeed at all. Target number against an average guy effectively jumps from 5 to 9 – cutting the odds of a d8 fighter hitting by two thirds. The injury potential is no more or less than unarmed striking, and there are some tricks a fighter can do to disadvantage his opponent without necessarily killing him. As with other types of combat in Fate, grappling is left a bit to the imagination, but there are no unique mechanics required at all. You attack, probably using Fight, Physique, or Athletics, while the defender probably gets to pick from either of those three as well. 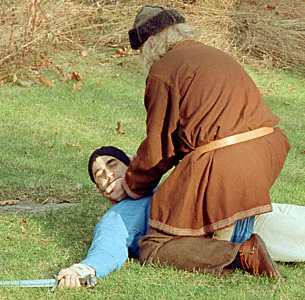 If successful, the victim will take either Stress or Consequences as usual, though the Consequences might be more “grab and restrain” and less “sucking chest wound” than enweaponed combat. Successfully imposing a Consequence grants an aspect on the grappled chracter (“Arm Bar!” or “I’ve got your gi!”) that can be invoked. This could produce very interesting death spiral effects, depending on if such things grant free invocations. Another way to go here – making perhaps equal sense – would be to treat the attempts to restrain the foe as attempts to Create an Advantage instead of an Attack. In fact, as success creates an Aspect with one or more free invocations, this makes a huge amount of sense – a good grapple lets you invoke one or two times for free, which seems like exactly the sort of thing that grappling should do in a narrative game like Fate. Creating an Advantage would be used for holds and throws, trips and restraint. 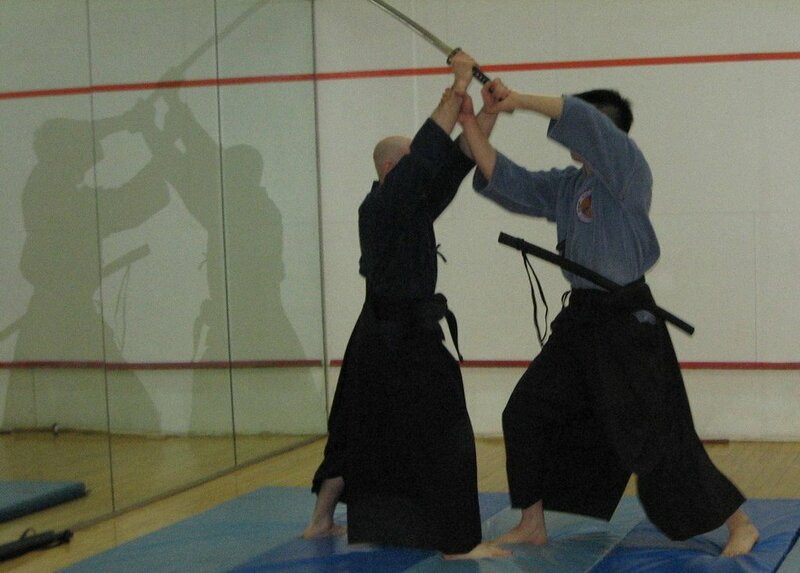 Attacks would be used for applying injury rather than restraint – breaking an arm rather than applying pain. It’s quite possible that such rules already exist in another book. I mostly try and stick to core volumes for this series, which includes Fate Core and Fate System Toolkit on my bookshelf. If I’m covering well-trodden ground with my suggestions above . . . that’s all to the good. 3rd Edition (note: 3rd edition is built off the “d20 system”, that is, everything runs off a simple “Roll 1d20, add relevant modifiers vs. opponent’s modifiers/required roll” for everything BUT grappling rules and damage dice) fell prey to this in an interesting way. Flowcharts are required to figure out what’s going on in Pathfinder, and that’s an incredibly cleaned up version of 3rd Edition’s grappling rules. 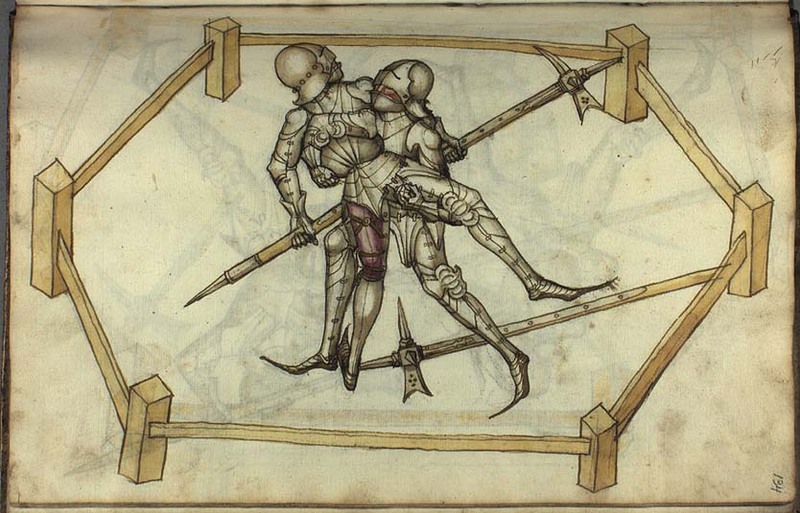 The original mechanics for grappling were worse. Fifth Edition has tried to make up for this (perhaps not as a specific design goal, or perhaps purposefully), and has mostly succeeded. The grappling rules appear in two paragraphs in the PHB. The basic mechanic is a contest, rolling against Strength (Athletics) on the attacker’s side. One may defend rolling against Dexterity (Acrobatics) or Strength (Athletics), both to avoid the initial grapple and also to escape. The results of a successful grapple impose conditions on the foe. The Grappled condition is the basic effect of a successful grapple, and it’s effects are very limited – the defender is immobile, with speed becoming zero and no bonuses to speed. That’s it. A Feat – appropriately named Grappler – allows a fighter to impose the Restrained condition on her opponent – this includes the immobility of the grappled condition, but includes giving attacks Advantage against the restrained creature, and the victim’s attacks have disadvantage. Disadvantage is also applied to Dexterity saving throws. The other grappling-like move, which can be used to represent takedowns and throws, is the Shove. Conveniently (and a good game design decision), the attacker uses the same check (Strength vs. Strength or Dexterity) for shoves. A successful shove gives the choice of moving the foe five feet away or knocking them prone. A prone character may only crawl, has disadvantage on attack rolls, and attacks against the prone creature has advantage if the attacker is within five feet, otherwise (such as for ranged attacks or attacks by Reach weapons), attacks have disadvantage. As a game-design choice, I find the Strength-based focus for grappling appropriate. Wriggling is a bit overrated in many games relative to the importance of sport-specific strength. Not that the wriggling isn’t good (it is), but it’s a force multiplier to power, especially in cases where rules go out the window. In melee, then, the same contest can be used to drive to three effects (though the third required the Grappler feat): the least effective is Grappled, rendering the attacker immobile. The next best is to throw the foe Prone, which has desirable game mechanical effects in melee combat. The third is more or less a combination of the first two, but is a progression – a grappler must first grapple her target, and then another successful grapple check applies the Restrained condition. The Dungeon Master’s Guide adds a few more options for grappling, including the ever-popular Disarm: a regular attack, contested by Strength (Athletics) or Dexterity (Acrobatics). One can also Overrun and Shove Aside, which moves the foe laterally instead of away from you. Warning: this is my wheelhouse. It’s also the highest resolution grappling system of the five presented. So here we go . . .
Making a grappling attack in GURPS is straightforward, and the basic mechanic is the same as any other melee attack: Make an attack using DX or any grappling skill, of which there are three. Judo is a hard skill that enables the signature Judo Throw and has dramatic benefits in defensive fighting, but is best when unencumbered. Sumo Wrestling is also average, and is a good grappling skill that emphasizes shoves and slams – it’s a solid skill for unarmed grapples and strikes, but is a poor choice to defend vs. kicks and weapons. Wrestling is an average skill that magnifies your ST when used for most of the uses of grappling, including locks, chokes, and breaking free, which is important since many grappling events involve contests of ST in GURPS. None of these actually increase your ability to grapple while on the ground, which is not terribly intuitive. For that, you want to maximize (drop 5 points into it) the Ground Fighting technique. This offsets the substantial penalties to skill and defense for being prone, and is the signature ability providing the “ground game” so often spoken of in MMA circles. By and large, Judo is a great skill for those wishing to emphasize defensive fighting on your feet, especially for light-fighters that emphasize DX over ST. Sumo Wrestling makes a great close-combat skill for those whose primary skill is fighting with weapons; shoving a foe from close combat to Reach 1 or Reach 2, or to ground a foe after grappling with a weapon or with an unarmed skill can be a real force multiplier. Wrestling is the go-to master skill for grappling offensively: its lower point cost and ability to give a boost to ST makes it an ideal choice for ST-focused warriors. A strong creature with a high skill in Wrestling, plus maxed-out Ground Fighting is a terrifying foe . . . until your friends show up with monster-stomping on their minds. The basic thing about grappling in GURPS is that, by and large, most things can be tried by all characters, though penalties may be high. There’s a lot of specificity here, but beyond the basic grapple, there is probably a more or less direct analog for every skilled move that can be done with pure DX and ST (sort of with the exception of the Judo Throw, Judo’s signature ability). Once you have grappled the foe, they’re at -4 to DX, which hits skills 1:1, and thus imparts -2 to Parry and Block, and -1 to Dodge. If you get specific and decide to grab a specific body part, such as an arm or leg, the penalties (based on the Basic Set and the nearly-required-reading Martial Arts) only apply to that body part. There are many follow-up techniques that can be attempted, and the Basic Set covers many. Things that can be attempted based on your ST or DX alone, with no skill requirement, will be noted by an asterisk (*). You can try for a takedown(*) to bear your foe to the ground, along with going to the ground yourself. This can be a good way to break a foe’s grapple. You can render your foe immobile and completely helpless for ten turns (ten seconds) with a Pin(*) by winning a Regular Contest of ST (harder than it sounds). You can choke him out using a Choke or Strangle(*), which can do damage to the neck as well as draining 1 Fatigue Point per turn (that can get debilitating fast, since while ST/HP can be arbitrarily high, HT and therefore Fatigue Points; will usually vary between 8 and 14). The Arm Lock can be a bit of an uber-ability in GURPS with the right character build, but requires Wrestling or Judo to execute. Neck Snap(*) and Wrench Limb (*) are both pure ST-based moves, the “Fezzik . . . tear his arms off” of the GURPS world. If your Ogres aren’t doing this against humans, as a GM you’re missing out on great fun. Finally, straddling the line between grappling and not-grappling is the Shove(*), which is based on DX or Sumo Wrestling, and if successful inflicts knockback. 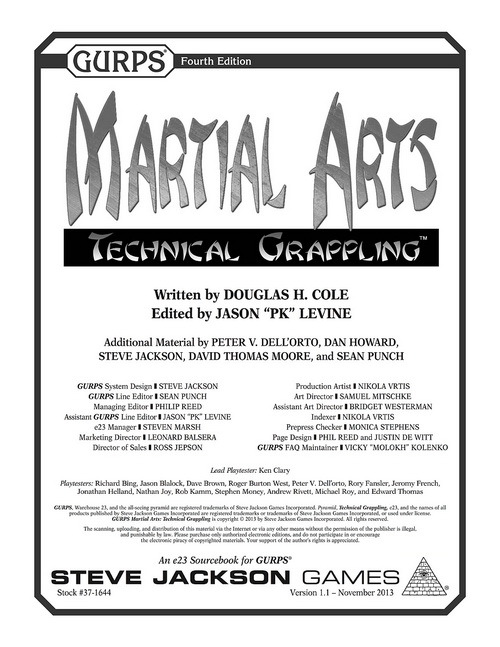 The Martial Arts book (by Sean Punch and Peter Dell’Orto) adds a lot of detail and options to fighting in general, and doesn’t leave grappling out. Special Perks are available to give minor benefits and avoid minor penalties for grappling special cases (the Rapid Retraction perk makes it easier to not get your leg grappled after a kick, for example). It also provides extra detail on many moves – one of which is that it makes clear that weapon skills are grappling skills in many ways. The Armed Grapple technique allows using a weapon to grapple a foe at a slight penalty, while Hook allows using a weapon to drag a foe to a kneeling posture . It clarifies, replaces, and provides a bit more utility to Ground Fighting. Not Grappling: While it flies in the face of some other games, a slam in GURPS is a strike for damage using your body mass. Everyone Can Play: You don’t need extra abilities to grapple or do fancy stuff. As noted, DX and ST by themselves suffice to get most things done, and there are specific skills for the rest. The abilities (Ground Fighting, Hook, Choke Hold, Arm Lock, etc.) described above are ways to be particularly good at certain things relative to someone who has trained broadly. They’re character differentiation options for the most part, giving game-mechanical weight to signature moves for a given character. They are not required. Get out, get out! : Breaking out of a grapple requires, mostly, a roll to Break Free. This is done by Winning a Quick Contest of ST to break free (this is where ST bonuses from skills come in darn handy). The grappling character can amass substantial bonuses (+5 for grappling with two hands, +2 per extra arm beyond the first two if you’re Goro or a tentacle creature, or -4 to ST if your foe is stunned), making it one of the cases where just being mighty is a true advantage. Foot Soldiers: There are also rules for using the legs instead of the arms to grapple, which enables “ground and pound” type strategies where you can put an opponent on the ground, switch your arms for your legs, and then pummel them freely, Pinned or no, with two free arms. You can also use only your legs to initiate grapples, though this will be most often done by grappling monsters and combatants on the ground – as one would imagine, grappling with the legs starting from a standing position tends not to leave a person standing. Drop that Weapon: Disarms can be done in a few ways, including grappling a limb and twisting it until the foe lets go, as well as a striking-based action; as with most GURPS options, it’s independently improvable if desired. If a character wants to have studied weapon retention so that it’s harder to do this to her, she can do that through the Retain Weapon Technique. Once a grapple is secured, and assuming the foe doesn’t manage to Break Free, most follow-on actions are resolved by Quick Contest, a mechanic similar to an opposed roll in D&D. On the attacking end, it’s usually choosing the best of ST, DX, or skill – though specifically which one depends on what’s being done. On the defense, you’ll be choosing between ST, DX (sometimes), HT (when the end result is injury), or skill. The “margin of victory,” how much your success (or failure, in many cases) exceeds your foe’s, often provides the value that turns a grapple into actual injury. In some cases, though, such as Throws from Locks (where you go through a process of grapple, lock, and then a throw), your final damage tally is your swing damage rather than margin of victory. There are lots of things you can attempt using the Quick Contest mechanic, including forcing foes to move in directions you’d like. Oh, and applying pain. You do the normal stuff to figure out the quality of your hold, but instead of applying damage, you can inflict a painful Aflliction (found on p. B428) instead. Agony means the victim is totally incpacitated, other than moaning or screaming, and it also costs 1 Fatigue Point (FP) per minute – so you can be drained, but seriously, 60 turns is a lot. Mostly this isn’t a combat concern beyond the first FP loss. Otherwise the various painful conditions impose penalties in addition to the already hefty -4 to DX for being grappled. An additional -2 to -6 for DX, IQ, skill, and self-control rolls. So unless you can absorb -6 to -12 in penalties because you’re just that good, this is a good way to put a crimp in a foe’s style in a nonlethal way. I hear that can be desirable. By and large, this is a good question in most RPGs. Our two narrative systems dodge the question a bit, in that for NBA the particulars of any given attack are mostly irrelevant, and purposefully so. For Fate, the mechanics are basically independent of the ‘type’ of combat, but it is easy to come up with Aspects and Stunts that are “grapple-flavored” rather than based on striking. The benefit of a grappling-flavored outcome is that it gives a solid choice for a non-fatal, or even non-injurious outcome that is solidly believable. There is no such thing as a harmless knockout (magic or magical technology excepted) – unconsciousness derived from striking is usually due to brain trauma and concussion, or even severe blood loss. They may go down, but it’s a non-trivial event. It is fully possible to immobilize someone with grappling and, once the conflict is over, have them get up and walk away. It’s also possible to kill ’em deader than hell with grappling, or leave a foe crippled. All squarely within the real of non-cinematic conventions, if that’s important. In the tactically-minded games (Savage Worlds, D&D, and GURPS), grappling mostly avoids the traps of “I Win!” buttons that have existed through the long history of grappling rules. Not always – certain character builds in the GURPS ruleset can be pretty abusable. Arm Lock can be improved to amazing levels on few points, and by only-slightly-generous interpretations of the rules, it’s possible for a trained person to Judo Throw a T-Rex. Rule Zero needs to kick in for the second one, and the one-trick-pony approach has drawbacks as well. The biggest thing that needs to be asked, though, is “are there situations where it’s preferable to grapple a foe rather than beat him to death with a pointed stick?” And in the most common flavor of game, dungeon fantasy, the answer is usually not just “no,” but “heck no.” Grappling is unarmed combat, and unarmed combat is, by and large, inferior to combat with weapons. Weapons extend reach, multiply leverage, and concentrate force. They also tend to not say “ow!” when used to attack and defend. Game systems tend to reinforce this, which is not a problem. That being said, if “because he needed killin'” isn’t a valid defense before a court of law, grappling provides a pretty good alternative to beating the snot out of someone, or various versions ending in impaling, dismemberment, or persuasion by laceration. Where grappling can find its mark is in using it to, in the words of Fate, Create an Advantage. In combination with weapons, a grapple (trip, push, lock, throw, takedown, or a flat-out grapple) can be used to achieve a level of temporary superiority that can change the balance of a fight. The most common, and usually most mechanically supported, method for doing this is to render a foe prone. This is worth -4 to attack and -3 to defend in GURPS, not to mention usually taking two whole turns to get back up. If done with a Judo Throw, you may even stun the opponent. Prone characters have disadvantage when attacking in D&D5, and are attacked from within 5 feet with advantage. Savage Worlds characters knocked prone are -2 to Fighting and Parry. It would be logical to use Create an Advantage to simulate throwing a foe down in Fate. All of these tilt the fight significantly against the character that’s rendered prone. The other common strategy is to render the foe immobile. Monsters that stick and move (or often, dart in, hit, and dart away) can be really annoying in any system, and fixing them in place for destruction is quite valuable. Another reason to grapple is the obvious where monsters are involved: it’s what they do. Even if grappling isn’t for your typical battleaxe-wielding murder-hobo, it most definitely is for many kinds of creatures. Constrictor snakes and monsters with tentacles should be represented as grapplers. 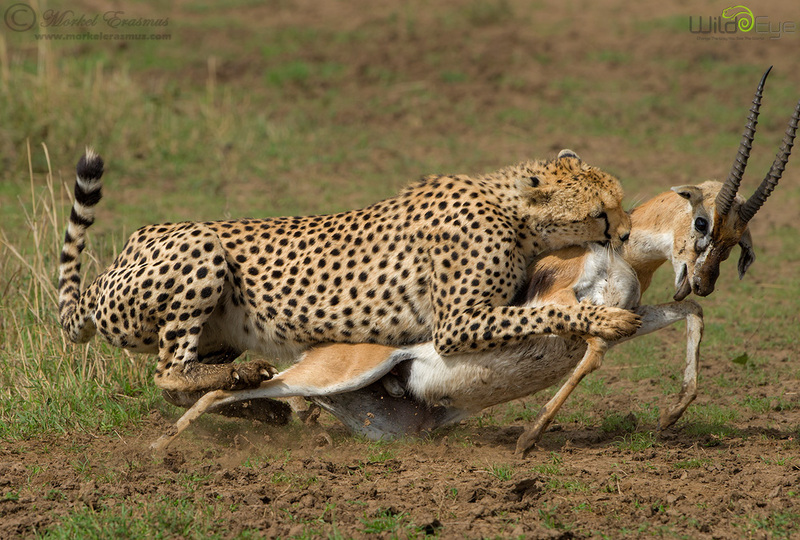 Likewise with many hunting predators – they pounce on a target, knock them down, and bite the neck. They do not do this to cause “hit points of damage.” They do it to choke to death their next meal. Being grabbed by a hungry animal (like, say, a Nile crocodile, with a bite force measured in tons) should be an event in any game that requires the PCs to change their drawers afterwards (hopefully not the players, though a bit of discomfort on their part is all part of the fun). And vampires? Grab and bite to the neck, and then a long, slow kiss that lasts for three days. That’s a grapple, or should be, with or without Bull Durham references. Grappling can be anything from an interesting change of pace adding flavor to a ritual combat, or a nifty trick that tries to tip the advantage in a fight. It can also be an interesting form of combat all by itself. But let’s finish where I started, looking at TVTropes, and picking a lot of nits. One participant will often have the advantage, which changes the respective options of the grapplers. This is true of armed combat as well as unarmed combat – one participant will often have the advantage. This may be handled by initiative, though some systems have implemented striking-based solutions where you can either attack or defend on a turn, but not both. In a game that’s highly abstract like NBA or Fate, all of those options are subsumed into a broad category such as Create an Advantage or Attack. In tactical games like GURPS, D&D, or Savage Worlds, you can implement as much or as little abstraction as the game calls for. I think the biggest trap here is to insist that the game mechanics have to be radically different because grappling isn’t striking. Fate and NBA avoid that trap very well. Older editions of D&D leaped right into that particular spiked pit. Savage Worlds and D&D5e have very limited outcomes from grappling actions, so there’s not much to go wrong. GURPS does OK in this respect, allowing a very wide variety of specific actions, but limiting the mechanics used to two or three – attack/defense rolls, quick contests, and regular contests. You just need to pick the right skills and techniques. You have to have rules for attempting to escape the grapple. This is a bit like saying “you have to have rules for parrying a blow.” You do, and you don’t. Game systems that resolve attacks as being aginst a Target Number (Armor Class for D&D, a flat number for NBA, a Parry score for Savage Worlds) can easily use the same mechanic for grappling if they choose. One could elect to make grapples not persistent, assuming that unless you do a grappling check every turn, your foe will elect to escape from the grapple unless you prevent him from doing so. I could easily see this in D&D5, for example, where a successful grapple check enables a Bonus Action that allows the imposition of Conditions such as grappled, restrained, incapacitated, and then paralyzed. Even if we allow that this is true, that doesn’t mean it’s hard. There’s nothing complicated about “win a Quick Contest of ST to Break Free” from a rules perspective. Likewise breaking a grapple by winning a contest of Strength (Athletics) vs. Strength (Athletics) or Dexterity (Acrobatics) is basically saying “use the same mechanics used to make a grapple to escape one.” That’s not exactly leaping a flaming chasm from a game design perspective. In fact, about the worst thing you can do is force a different mechanic for every different type of potential action unless it’s strictly required. Embrace the abstraction if the game system is abstract, and try and hew to common mechanics if it’s not. All five games do well here, or at least well enough. You have to figure out how disabled the participants are, if somebody outside the grapple tries to attack one of them. This is true of weapon combat as well! If I get smacked by an axe in D&D, I lose hit points . . . and that’s it. My AC is not changed, my saving throws don’t go down. If I get whacked in GURPS, I suffer skill penalties based on shock. This impacts what happens if a third party tries to poke me with a spear or shoot me with an arrow. An abstract system can handle this easily – D&D could invoke Advantage and Disadvantage, Fate might call a grappling fight a unique Zone, or a one-way zone. If you’re in a grappling fight, others can be in your Zone without you being in theirs. Again, the key is to borrow ruthlessly from existing mechanics. The chance that an attacker aiming for one participant in the grapple might hit the other. This is often true for ranged combat into melee regardless of whether the fighters are striking or grappling. It’s not unique. What kinds of attacks are available, and/or what the results of the grapple are. There are many kinds of striking attack as well, and this doesn’t seem to bother people. Slams, shoves, pushes, disarms, called shots, striking to stun/nonlethal damage, kicks . . . grappling hasn’t built a hotel on Complexity Avenue here. (optional) As if that weren’t enough, you can potentially still engage in a limited form of standard combat while grappling, possibly even against people you are not grappling with. True of striking as well. Stabbing two people at once, shooting at a near or a far target, or having a grab lead to a stab, or using a stab as a grapple are all completely possible. My point here is that grappling is no more more less complicated inherently than striking with or without weapons. There are good and bad game design decisions that can (and have) be made, but the mistake is to depart from the paradigm of the game being played. If Kenneth Hite had inexplicably decided that even though all other combat in Night’s Black Agents was made with a single roll against a fairly static target number, grappling would be different, this would have been a problem. In the real world, his Game Fu is very strong, and he flat-out states to use the existing rules as-is, and not go looking for new ones. This is not the first treatise I’ve written on grappling. 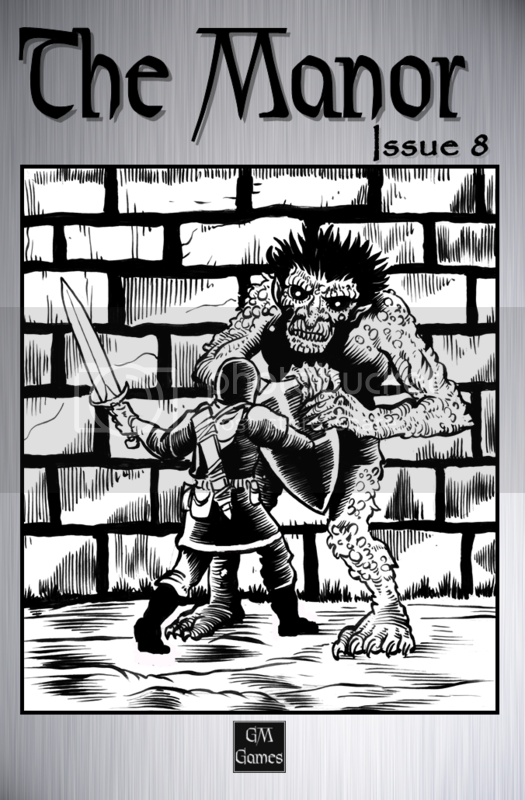 I’m the author of GURPS Martial Arts: Technical Grappling, as well as a short article with Peter Dell’Orto for Tim Shorts’ The Manor, Issue #8 that attempts to apply a simple, common design framework (described as Rules for Grappling Rules) to OSR-themed D&D games. It would be easily extensible to 5e, and likely other editions, as well. I’ve also written extensively about grappling on my blog over the last few years. That doesn’t mean I’m right about stuff, but I have certainly killed my share of both trees and electrons wrestling with the topic. Grappling is an oft-neglected aspect of fighting – especially with weapons – in games. Not always, and it is occasionally done well. But given that many, if not most, weapon-based fighting manuals written by folks that expected their students to have to defend their own lives and take the lives of others through violence nearly always included a wide body of grappling techniques in their fighting advice, I feel like it’s important to have that kind of variety and option in games where it can be supported and it doesn’t break the rule for keeping it all at the same level of abstraction. Where that can be done, having fights smoothly flow between a primary weapon, a secondary weapon (including a shield), and hands and feet used for both striking and grappling should not be an unattainable goal. Fantastic article, Douglas! It has reminded me that I really need to get finishing my own Martial Arts related articles, languishing in "Draft" as we speak. And to finish reading Technical Grappling…busy busy. Your mention of animals/monsters as grapplers is spot on. Most games (video or otherwise) focus on the lunging bite or claw (guilty) as a mode of attack, when in reality the creature's bodyweight is its real weapon. And with many real world fighting styles – armed or unarmed – grappling plays a real part. The actual skill of a "knife fighter" is grappling, mostly to immobilize for a Rapid Strike and/or All Out Attack (Double), best thrown as a Telegraphic Targeted Attack (Vitals), or somesuch. Even today's tomahawk vs smallsword endeavors involved a fair amount of grappling. Grappling's something that has rarely featured in my games. When I had a guy basically playing Fizzik, he did do some but really his giant whopping club or ham-sized fists were a better recourse. Typically, my players aren't historically ace with rules, grappling ones even less. Thus, I hesitate to deploy grapples. Something I may well have to change sometime in the near future; my player and I have often spoken of a grapple-heavy game just for the sake of being swift with it. To do!